Driveways undergo a lot of wear and tear. Vehicles come and go on a daily basis, plus they are exposed to the elements constantly. If your driveway is plagued by unsightly cracks and oil stains it is likely time to have it repaired. Check out the options below for repairing concrete driveways. 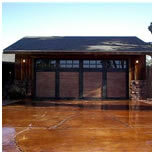 On this project, the concrete driveway was stained and the existing cracks accentuated to achieve a rustic look. Now the driveway looks like leather, which accents the ranch style of the home. This project proves that repairing a driveway doesn't have to mean tearing out the concrete and starting fresh. A little stain and a creative perspective can go a long way at improving your home's curb appeal. 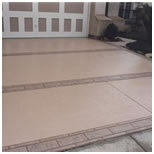 Another option is to have an overlay installed over your damaged concrete. Typically this involves crack repair and surface preparation and then the application of an overlay. The overlay can be colored, stamped or engraved to create a decorative effect. Think of resurfacing as giving your driveway a facelift – it will have a much fresher appearance in the end. If your driveway has become uneven due to sunken portions, this too can be repaired. The concrete can be lifted back into place with a process called slabjacking. Learn about how contractors can fix a sunken driveway with slabjacking. If you'd just like to give your gray driveway a good spring cleaning, you can have it power washed, sprayed with degreaser, or cleaned with acidic chemicals. The cleaning method is best determined by the type of stain. A concrete contractor can identify the stains on your driveway and recommend the best course of action.